A portrait of 18-year-old Ibrahim Ibrahim standing on the platform of a MAX light rail station with the train in the background. Ibrahim Ibrahim works at an insurance office in downtown Portland. To get there, he drives from his home or school in Tigard to the Sunset Transit Center in Beaverton to take the MAX. It’s a race to get to work on time. 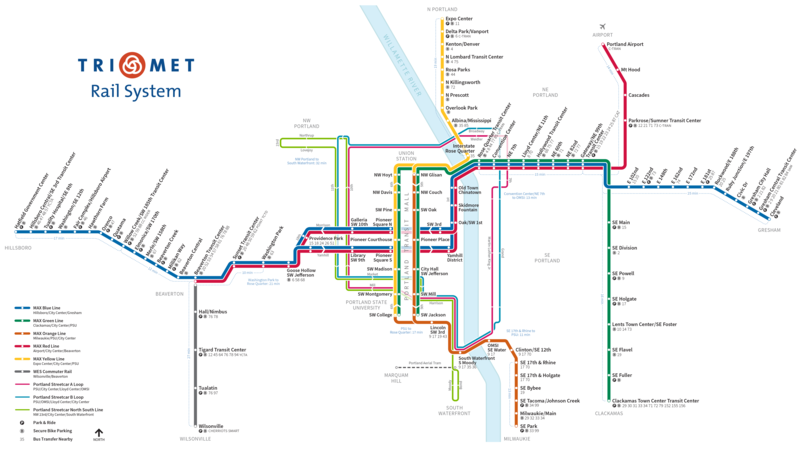 Admira Baltic, who works at Oregon Health & Science University, welcomes a regional proposal to build a new MAX line in the Southwest Corridor. She said light rail would be “amazing,” cutting her commute to work in half from her home in Raleigh Hills. A photo of AJ Romero-Gemmell waiting for the train at the Milwaukie/Main St MAX Station. AJ Romero-Gemmell relies on transit to get to school from his home in Milwaukie. It can take anywhere from an hour and a half up to more than two hours. Manuela Martinez Espinoza waits for a bus shortly after 6 a.m. to go to work on a Saturday. Johnnie Shepherd enjoys living in his neighborhood, which he describes as "centrally-located." Several bus lines, the MAX, the Portland Streetcar are all walking distance from where he lives. Humberto Rodriguez catches the bus at around 5:30 a.m. each day from Beaverton to Portland. He relies on transit for all his trips. Linda and Richard Edwards wait for a bus with their daughter to go grocery shopping in Tigard on a Saturday afternoon. Erik Halstead used to rely on transit to commute. In recent years he's chosen to drive instead. He said driving offers more reliability to get to places on time. Erik Halstead used to rely on transit to commute to work. In recent years he's chosen to drive instead. He said driving offers more reliability to get to places on time. “My life will be much easier.”“I'm traveling, constantly.”“There's all sorts of trade-offs.”“How am I going to do this today?”“It got to the point where I just had to drive.”"Every year it gets better. "“It would be nice to… get to your destination within 30 minutes to an hour.”Stay informed. Get involved. June 7, 2018 4:50 p.m.
Who lives, works and plays in the Southwest Corridor? Who are the people who would be affected by transportation investments here? Admira Baltic has an hour-long bus ride from her home in Raleigh Hills to get to her job at Oregon Health & Science University in Southwest Portland. Her shift begins at 7 in the morning and the earliest bus leaves at 6 a.m.
Baltic said a new MAX line in the Southwest Corridor would be “amazing,” cutting her commute time in half. Admira Baltic is retooling her career through free training offered by OHSU and IRCO. That program has been expanded with support from a Metro grant. In April, Baltic received a life-changing opportunity: a grant that pays for her training to become a pharmacy technician. The program covers the cost of tuition, books, uniforms and accreditation, and pairs grantees with a career coach from the Immigrant & Refugee Community Organization. The new job will offer Baltic a higher income, affording her housing security to stay in her neighborhood near the proposed light rail line. OHSU and IRCO are expanding this program to a new cohort with support from a Metro grant. Winning a grant also marks a meaningful milestone in Baltic’s life. Her father was killed in the Bosnian war in the 1990s. Her mother gave up everything to leave with three children, including Baltic’s six-month-old sister, for the United States. The family spent two years in an immigration camp in Hungary before coming to the U.S. When it was time to leave, Baltic had no shoes to wear. Her mom cleaned an entire clinic at the camp in exchange for a pair of shoes. All they had for 16-year-old Baltic were ill-fitting high heels. Baltic’s supervisors gave her their full support since she told them she planned to apply for the grant. Baltic sees this new career path as a step to eventually become a department leader. She hopes earning a higher hourly wage means more quality time with her family, doing the things she couldn't do when she lived paycheck-to-paycheck. She's never been on vacation with her family. She intends to change that after she gets settled into her new job. AJ Romero-Gemmell has a long commute to get from his home in Milwaukie to the Sylvania campus of Portland Community College in Southwest Portland. It takes one and a half to two hours to get there in the morning and usually even longer, fighting traffic, to get home at night. A college freshman, Romero-Gemmell plans to major in political science and law, and minor in business and Spanish. He wants to be a civil rights attorney representing immigrants and minority groups. Political science courses are spread out at different PCC locations. That means he often attends classes on multiple campuses. A portrait of AJ Romero-Gemmell as he arrives on the Sylvania campus of Portland Community College for his 8 a.m. math class. He makes these trips totally relying on public transit. He plans his days around bus and light rail schedules. If he leaves an evening class too late, he runs the risk of being stranded in downtown Portland because the buses he takes home stop running late at night. Romero-Gemmell puts serious thought into planning his trips, often asking, "Am I even going to be able to get home from Cascade to my house at that point in time?" He would like to see more frequent TriMet MAX service to make the light rail car less crowded during his rush-hour commute. In addition, he’d like to see expanded bus service hours in Milwaukie so he doesn’t have to walk home from the Milwaukie/Main St. MAX Station. When he was younger, Romero-Gemmell tried bicycling in his neighborhood, but stopped because he didn’t feel safe. Romero-Gemmell is excited about the prospect of a new MAX line that would stop near PCC Sylvania. “When I first heard about the proposal to add a MAX [line] in the Southwest Corridor, I was ecstatic to say the least,” he said. He also works on campus as a student organizer for the Associated Students of Portland Community College. Part of his job is to represent student voices to PCC administrators. A station that serves Sylvania would be a huge asset to the campus. “I also know tons of students out here at PCC Sylvania community who... would love to have a MAX out here. That would make their quality of life better,” he said. High school senior Ibrahim Ibrahim lives close to the Oregon Islamic Academy, his school in Tigard. Driving is convenient to get to class, but the afternoon commute to Portland to his job gives him anxiety. Ibrahim works at an insurance office in downtown Portland. To get there, he drives from Tigard to the Sunset Transit Center in Beaverton, parks his car and then takes light rail. It’s a race to get to work on time. “Punctuality is huge,” Ibrahim said, underscoring the risk of losing a job due to tardiness. That’s the challenge he identifies for transit-dependent young people in Tigard. He sees a plethora of jobs in the retail and food service industries. Volunteer opportunities and jobs in office settings, on the other hand, are hard to come by. He was able to get a job with his employer because his boss was willing to take a chance on him to build work experience. Ibrahim says his boss is understanding on the few occasions he’s arrived to work late. Ibrahim would benefit from a faster and more reliable transit option from Beaverton, but he fears the market forces that tend to change communities when light rail comes to new neighborhoods. Social justice issues are important to Ibrahim, whose parents emigrated from Sudan to the U.S. a few months before he was born. He is a youth ambassador at his school, representing his Islamic faith. He also volunteers in the youth activist collective for The Center PDX in North Portland. This work often involves engaging with immigrant student communities, “so they don't feel marginalized” in school, he said. He doesn’t yet know what career to pursue, but he knows he wants to make a positive impact on the world. He strongly believes regional decision-makers need to consider those potentially most affected by the construction of a light rail line and address their concerns. “I feel like as long as their lives are maintained and taken into consideration, I'd say go for it and I would really appreciate the project,” Ibrahim said. Each weekday, Manuela Martinez Espinoza steps out of her apartment in Tigard at around 5:15 a.m. to catch her first bus to go to work at a restaurant in Beaverton. Manuela Martinez Espinoza, who lives in Tigard, walks along Hall Boulevard to get to her bus stop for her commute to work on Saturday mornings. Often, it’s still dark outside when she starts her commute. Martinez Espinoza wears a vest with reflective stripes and carries a flashlight in her hand during her 25-minute walk to the bus stop. Portions of her walk have sidewalks; others don’t. It’s a lonely walk, except when cars swoosh past her, or she runs into her neighbor on his morning stroll. Across town in Beaverton, her boyfriend, Humberto Rodriguez hops on the bus around 5:30 a.m. to go to his construction job in Portland. Sometimes Rodriguez gets assigned jobs in other parts of the region. As people who depend on transit, they are both excited about a proposal to extend the MAX system through the Southwest Corridor, from downtown Portland to the Bridgeport Village mall in Tualatin. Other parts of the Southwest Corridor Plan include trails, sidewalks, new bus lines and road improvements. That’s recently changed. As part of its Southwest Service Enhancement Plan, TriMet added a new 42 - Denney/Hall bus line that runs through her neighborhood. Martinez Espinoza finds herself using it, which cuts down some of the walking she has to do during the weekdays. She still has to walk a lot on Saturdays, another workday for her. Her commutes take a while. But she makes it work by using all travel options available, including the Westside Express Service. Recently Martinez Espinoza booked medical appointments in downtown Portland and Tualatin. “I made it to each of my appointments on time,” she said. Being transit-dependent means that Martinez Espinoza always has to plan ahead to get where she needs to be, “I’m always thinking, ‘How am I going to do this today?’” she said. Rodriguez and Martinez Espinoza would like to live together near downtown Tigard, where they would be closer to more bus lines and, potentially, a new light rail in the future. Erik Halstead sits in the middle of his home office in Tigard surrounded by toy models of different transportation vehicles: buses, trains and airplanes. His bookshelf is full of books about railroad history, including one about Oregon’s Southern Pacific Railroad. Halstead thinks that would surprise people who may think he’s anti-light rail. A longtime critic of Metro and TriMet, Halstead is a vocal opponent of the proposed Southwest Corridor light rail. Even though he no longer uses transit, he attends community meetings about it whenever he can. Halstead used to work at a call center near downtown Portland. “For many years I relied on TriMet,” he said. “But over the years as the buses just became less and less reliable for various reasons, it got to the point where I just had to drive." Driving offers the flexibility to change routes if and when he gets stuck in traffic. "For the most part for where I travel, it would not serve my needs," Halstead said about the proposed Southwest Corridor light rail line. He no longer works in Portland and commutes toward the Beaverton-Hillsboro area. Halstead is a student at the Rock Creek Portland Community College campus, where he's studying to be an airplane mechanic. He would rather see more investments on bus rapid transit before any investments on expanding the light rail system. Halstead thinks the rail line's proposed route won't help as much as it could, because it skips two major employment centers: Kruse Way in Lake Oswego, and Washington Square near Tigard. “Those are two of the largest employment centers in our area," he said. Halstead is also a proponent of strengthening suburban bus connections. "Every year it gets better." Johnnie Shepherd came to Oregon in the early 1970s for a new opportunity: a job at Timber Lake in Estacada through the U.S. Department of Labor’s Job Corps program. He said he left Alabama with “a negative view of the world.” That view started to change when he moved to Los Angeles, where he went to high school and lived with an aunt. “From California I come to Oregon and Washington – all over the West Coast,” Shepherd said. “So my travels with people really changed my views about the country and people.” He befriended people of different races and ethnicities. And so did his children. Shepherd said Oregon, with its natural beauty and welcoming people, kept calling him back. He’s close to bus lines, the MAX, Portland Streetcar, businesses and restaurants. He remembers how long his commutes would take when he lived in West Linn, Lake Oswego and Tualatin. Shepherd thinks plans to bring a new MAX line to the Southwest Corridor will benefit people like him, who rely only on transit to connect to jobs. He believes light rail will create many opportunities for the area, from new jobs constructing the project to new connections for existing businesses. How we get to where we live is an individual journey. Listen to how Johnnie Shepherd, and Linda and Richard Edwards came to live in Southwest Portland. Linda and Richard Edwards became totally dependent on transit after a series of major obstacles. The house they were renting in Portland went into foreclosure not long after they moved to Oregon from Arkansas in 2011. With little notice, they scrambled to find a place to live with their two young children, who were about 5 and 7 years old at the time. It wasn’t easy to find a new place they could afford. They tried to stay together as a family, but on occasion they’d send their kids to stay with one of Richard’s older sons in Gresham. For about six months, the Edwardses stayed in hotels, tried to set up camp in the city, or slept in their car. Such an upheaval is difficult for any family. It was even more challenging for the Edwards family because of Linda’s health. Linda was born with a bone disease, hypophosphatasia, which affects her ability to move. She has to use a wheelchair to get around. Richard quit his job, so that he could care for Linda while they looked for shelter during that period. The Edwardses eventually found apartments to rent, including their current home in Southwest Portland, with help from the nonprofit JOIN. They live in a regulated apartment building, where rent is capped according to people’s incomes. After struggling to keep up with expenses, Richard gave up his car and started riding the bus with Linda. The Edwardses enjoy the experience of riding on a MAX train better than a bus for several reasons. It’s easier for Linda to get on and off the train. And the family doesn’t have to separate. When the buses are crowded, the kids sit where they can while Richard stays close to Linda. The Edwardses are excited by the prospect of a new light rail line in the Southwest Corridor. They would still have to take a bus from their apartment to a MAX station, but they anticipate riding the train would cut their travel time by at least half an hour. “It would be nice to hop on a bus ride for ten minutes, get on a MAX [in the Southwest Corridor], and be able to get to your destination within 30 minutes to an hour,” Linda said. They plan to stay put in Southwest Portland. They love their neighborhood and apartment, which is regulated and protected from rent increases they cannot afford. The Edwardses look forward to the day when they can ride a MAX train along the Southwest Corridor. With fewer transfers and easier access, Linda said she would even venture to ride the train by herself. Learn more about the Southwest Corridor Plan. Metro wants to hear from you during the next public comment period. Stay tuned and sign up for updates. An overview of the Southwest Corridor Plan partners and their roles.